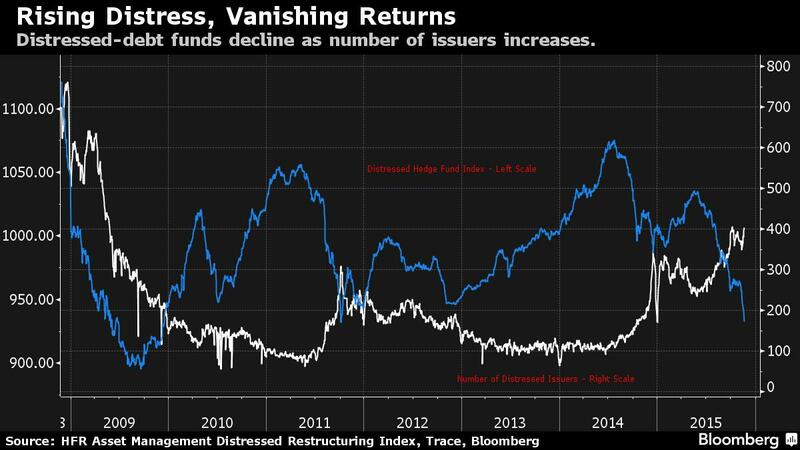 It’s mid-November, but for investors who trade in the debt of distressed companies, the year’s already done — and they lost.Hedge funds that specialize in the debt are grappling with their worst declines in seven years. Funds managed by Knighthead Capital Management, Candlewood Investment Group, Mudrick Capital Management and Archview Investment Group all posted losses through October. And year-end bonuses at Wall Street desks that trade distressed debt could be slashed by a quarter, Options Group said.After six years of easy-money central-bank policies kept over-leveraged companies afloat and left scant opportunities for traders who profit off the market’s scrap heaps, a rout in commodities prices in 2014 presented what had seemed like a perfect chance to buy again. Instead, those prices only declined further this year, causing the debt of everyone from oil drillers to coal miners to fall deeper into distress. As the losses intensified, gun-shy investors pulled back from almost anything that smacked of risk, spreading the losses to industries from retail to technology. Distressed hedge funds dropped 5 percent in 2015 through October, putting them on pace for their worst year since 2008, when they lost 25 percent. They’re lagging behind hedge funds across indexes, which are flat for the year, according to Chicago-based data provider Hedge Fund Research Inc.
November isn’t looking like it will be much better. A Bank of America Merrill Lynch index of distressed debt is down almost 8 percent this month as the average price of bonds in the benchmark dropped to 57 cents on the dollar, from as high as 75.6 cents in February. Mudrick Capital lost 16 percent this year through Oct. 31 in its main fund, according to a person with knowledge of its returns. A $1 billion special-situations fund managed by Candlewood is down 11 percent, according to a document obtained by Bloomberg. And Knighthead Capital, which manages $3.4 billion, lost 8.7 percent in its main fund, according to performance updates. Some funds’ biggest losses have come from energy companies. As banks and other traditional investors pulled back from oil and gas producers and firms that service the industry, many investors began stepping in earlier in the year to take advantage of increasing yields. As the price of oil continued to decline, prices on the debt continued to sink, triggering losses of more than 43 percent among energy firms in the distressed index, the Bank of America Merrill Lynch index data show. “We’ve been early,” Jason Mudrick, founder of Mudrick Capital, said in an interview. “Anybody that’s had meaningful exposure to this industry has been early. It doesn’t mean we’ll be wrong. It just means we’ll have mark-to-market losses” in the short-term. Mudrick declined to comment on his firm’s returns. Archview, which has $800 million under management, dropped 6.8 percent, according to an investor update. It was hurt by its two biggest losing positions: Magnetation LLC, a company that owns iron-ore concentrate plants, and Getty Images Inc., the digital photography business owned by Carlyle Group LP. The hedge fund, which is headed for its second down year since Jeff Jacob and John Humphrey started it in 2009, also made wrong-way bets on oil and gas company Templar Energy LLC, Arch Coal Inc. and Murray Energy Corp.
Peter Rup, chief investment officer at Artemis Wealth Advisors LLC, believes there’s more pain ahead for debt investors. Even prices for energy securities have further to fall if equity markets drop or the U.S. enters a recession, he said. “People are dabbling in distressed shale oil and gas businesses right now and the outcome will not be pretty,” said Rup, who invests $900 million for about a dozen wealthy families and small colleges. Still, other investors say they can find potentially attractive positions if they’re willing to take a chance. In particular, investment managers are focusing on transactions that wager on a recovery in commodities next year. Debt exchanges and rescue financing deals are picking up. “Borrowers have limited capital availabilities now and that means opportunities for private-capital providers,” said John Van Benschoten of Oaktree Capital Management LP. Some investors say investing in energy distress is becoming a good bet. Michael Tiedemann, the chief investment officer for the $9.5 billion Tiedemann Wealth Management, said banks aren’t putting new loans on their balance sheets, oil prices remain low and redemptions could force funds to liquidate some holdings, making energy credits attractive. “Now is the time you should be putting capital to work, anticipating that it’s going to be messy for the next six months or so” in the energy industry, said Tiedemann. Argentina has proved one of the few bright spots in the rout. Knighthead, led by Thomas Wagner and Ara Cohen, recouped some losses in October when its fund rose 0.8 percent, led by gains in the South American country’s sovereign debt, according to an update to clients. Canyon Capital Advisors told investors last month that it was starting to raise money for a new distressed vehicle that it will be able to tap when companies no longer have easy access to credit. The firm’s Value Realization Fund, which also makes wagers outside distressed credits, had gained 1.7 percent through Oct. 9, according to a document obtained by Bloomberg that described third-quarter results. “The increasing fragility of certain business models is beginning to be reflected in a number of ways, including wider credit spreads, lower liquidity, and a material and sudden expansion of the stressed and distressed debt universe,” the firm wrote in a letter dated Oct. 19, explaining its rationale for the new pool. Representatives for Knighthead, Archview and Canyon declined to comment. Candlewood didn’t immediately respond to requests for comment. Ultimately, for investors in troubled debt, 2015 is almost over and the real game will be played next year. The question is how funds will ensure they are there to participate. This entry was posted in Alternative Credit, Hedge Funds and Liquid Alternatives, Investing in Alternatives and tagged GHP-COF. Bookmark the permalink.